With the optional desktop software for Mac or Windows, users can easily manage and synchronize lists between their iPads and desktop computers. The release of the iPad version of SplashShopper follows SplashData's earlier release of an iPad version of SplashID, the company's best-selling secure password manager. SplashID offers a simple-to-use interface for storing, organizing and accessing passwords, PINs, account numbers, frequent flier numbers, and any kind of information that needs to be readily available yet completely secure. 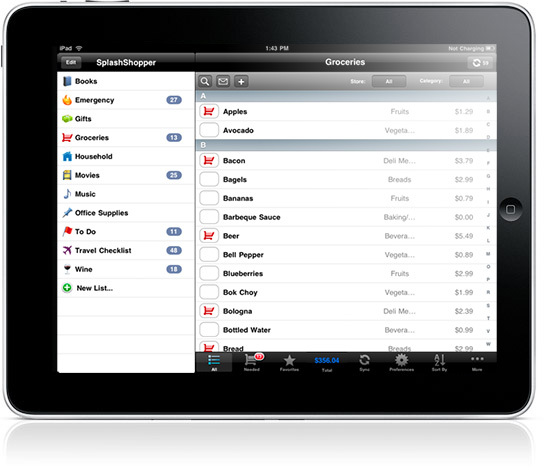 SplashShopper 3.0.3 for iPad is $4.99 USD (or equivalent amount in other currencies) and available worldwide exclusively through the App Store in the Lifestyle category. The companion desktop software for Mac or Windows is available at the company's website for $9.95. Founded in 2000 and based in Silicon Valley, California, SplashData is the leading developer of mobile productivity and security software. The company's applications include SplashID, SplashPhoto, SplashMoney, SplashShopper, SplashTravel, SplashClock, and SplashWallet. Copyright (C) 2010 SplashData, Inc. All Rights Reserved. Apple, the Apple logo, iPhone, iPod and iPad are registered trademarks of Apple Inc. in the U.S. and/or other countries.